How did these tropical coconut-based treats make their home on the Passover grocery store shelf? Few foods represent Passover as much as a box of matzah, gefilte fish, and those dense and chewy coconut macaroons. Most foods at the seder have symbolic ties to the story of Passover, or at least to a traditional Eastern European or Sephardic recipe. But not so for coconut macaroons. How did these tropical coconut-based treats make their home on the Passover grocery store shelf? With some recipe sleuthing, linguistic investigation, and history lessons, we might just get to the bottom of this Passover mystery. Let’s start with the basics: What is a macaroon? Whether they’re French macaron sandwiches, Italian amaretti cookies, or kosher for Passover chocolate-dipped coconut macaroons, they’re made with a base of egg whites and sugar, which gets mixed with almond paste, almonds, pistachios, or shredded coconut. Until coconut became available to European and American bakers in the late 1800s, though, macaroons were nut-based. Almond macaroons were first made by Sicilians, who learned the trade from Arab troops from Tunisia who captured Sicily in 827. By the 13th century, Sicily was a famous center of pasta and almond-paste and rosewater sweets like marzipan (marzapane) and macaroons. Italian macaroons caught on, especially in the Italian Jewish community, who savored these flourless treats during Passover. To this day, Sephardic Jews from Syria and Egypt make their Passover macaroons without coconut, using ground pistachios, almonds, and cashews. Around the time when Eastern European Jews immigrated to the US, the macaroon scene shifted towards coconut. The addition of coconut hinges on a discovery by Franklin Baker, a Philadelphia flour miller. Baker saw in coconut a promising new baking ingredient, and he was the first to discover that shipping shredded coconut was much more affordable and shelf-stable than shipping whole coconuts. As predicted, pastry chefs and home cooks soon fell in love with shredded coconut. Somewhere, someone discovered that replacing almond paste with shredded coconut created macaroons that didn’t spoil nearly as quickly, and were more sturdy and shippable than the traditional almond macaron. 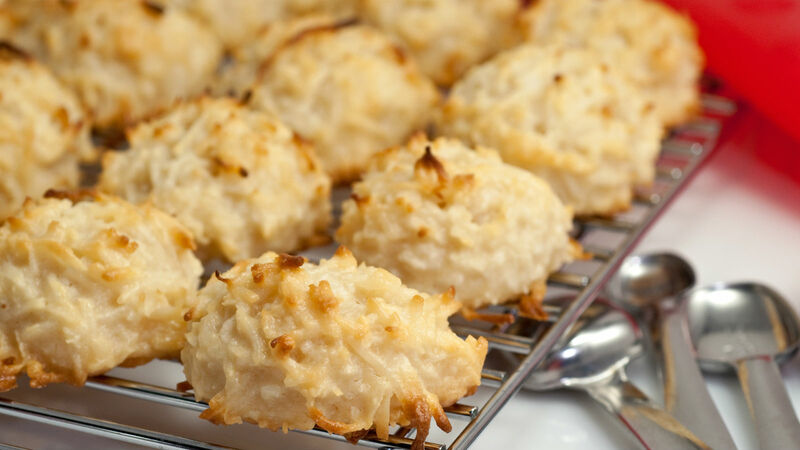 Coconut macaroons were immediately swept up into new marketing campaigns begun by kosher companies in the late 1800s. As Leah Koenig writes, kosher for Passover chocolates, matzah ball mixes, and coconut macaroons were made on a large scale and marketed to Jewish families during the holidays. American Jews suddenly found it easier than ever to observe the holidays with ready-made and shelf-stable foods–the same Streit’s and Manischewitz tins and boxes that we recognize today. The macaroon saga continues today, with endless variations on the classics. The coconut macaroon might just be as popular as their pastel sandwich counterparts; Brooklyn cafes right now are stocked, year-round, with coconut macaroons with hints of matcha, sea salt caramel, chai, and more. From Arab conquest to Sicily to your kosher for Passover grocery store shelf, coconut macaroons are dense with history and flavor. They’ve always been a lot to chew on, after all.